Here we are on an average day - 15+ kids in the pool and a few moms lounging/life guarding on the deck. There are 17 kids that live within our 3 houses next door to each other which accounts for most of the bodies in the pool on any given day. And when you add in friends and neighbor kids that quickly turns into a pool party. We keep trying to convince our pool service to treat our pool as they would any other community pool, but they just won't agree to it. Something about a "residential contract" or something like that. Here is another pool friend that showed up on this same day. Buffy spotted him on the chair next to me and all the ladies had a great yelp and squeal because of him. 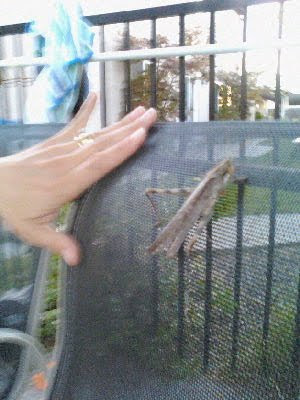 This grasshopper was HUGE! - almost as big as Buff's hand. Sorry for the picture quality - I had only my cell phone camera on hand at the moment. 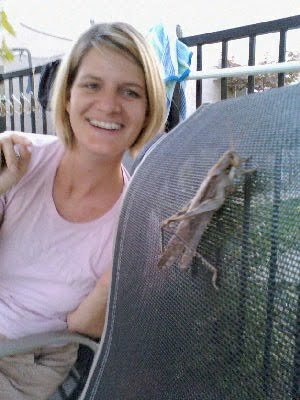 Like I said, we are out there by the pool on most hot afternoons - grasshopper friend or no grasshopper friend, but definitely with lots of people friends.